The hot stove is starting to get real hot, folks. Within the last week we’ve seen Robinson Cano and Edwin Diaz get traded to the Mets, Jean Segura land with the Phillies, Patrick Corbin sign with the Nationals, and Nathan Eovaldi re-sign with the Red Sox. The Winter Meetings begin next week and already some Very Big Things have happened. The Cardinals got in on the action earlier this week when they acquired Paul Goldschmidt, arguably the best first baseman on the planet, from the Diamondbacks for youngsters Luke Weaver and Carson Kelly, prospect Andy Young, and a competitive balance draft pick. Kelly’s a personal favorite, but I’m not sure there’s a future stud in that package. Seems more quantity over quality. Anyway, St. Louis plans to put Goldschmidt at first base (duh) with Matt Carpenter shifting back to third base, where he has been a consistently below-average defender in his career. This isn’t quite moving Miguel Cabrera to third base to accommodate Prince Fielder, but it’s close. The Cardinals will live with the defensive hit at third to add Goldschmidt to the middle of their lineup. I would too. Adding Goldschmidt gives the Cardinals a surfeit of infielders. They have Goldschmidt and Carpenter on the corners, Paul DeJong and Kolten Wong up the middle, Jedd Gyorko and Yairo Munoz on the bench, and top 20 organizational prospects Ramon Urias, Max Schrock, and Edmundo Sosa all slated to return to Triple-A next season. Infield depth is good. Gotta have it. St. Louis has enough infield depth that trading an infielder to address other roster needs is doable if not inevitable. Gyorko is believed to be the most expendable — that was the case even before the Goldschmidt trade — and that makes sense seeing how he’s the oldest and most expensive among the non-starters. Spending $9M on a bench guy might be too much even for the Cardinals. 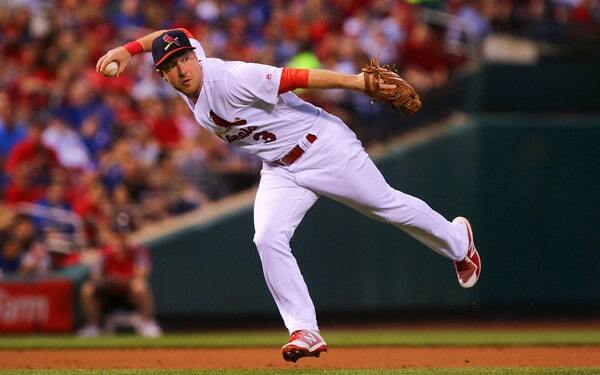 The Yankees need an infielder to replace Didi Gregorius, and now that Goldschmidt presumably makes Gyorko even more expendable than he was coming into the offseason, I think it makes sense for the Yankees to reach out to St. Louis about a trade. Another right-handed hitter doesn’t help balance the righty heavy lineup, I know, but Gyorko brings other stuff to the table makes up for it. Let’s talk this out. 1. The Yankees have had interest in Gyorko in the past. Specifically at the 2015 trade deadline. Jon Heyman reported the Yankees offered then top prospect Jorge Mateo to the Padres for Craig Kimbrel and Gyorko, but San Diego said no. Gyorko’s contract was underwater at the time. It was one of those “we’ll take on that bad contract if you give us that good player” trades a la Cano/Diaz. The Padres dumped Gyorko on the Cardinals a few weeks later and he turned his career around. St. Louis got good value from the contract. Point is, Gyorko was on New York’s radar at one point. 2. Gyorko can hit. Not exceptionally well but at an above-average rate. 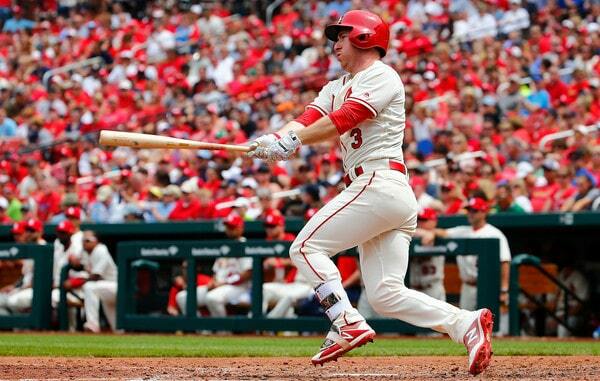 Over the last two seasons Gyorko has produced a .268/.343/.447 (111 wRC+) batting line — his wRC+ in his three years with the Cardinals: 112, 112, 110 — with good walk (10.3%) and strikeout (20.6%) rates, and 31 homers in 883 plate appearances. He’s annihilated lefties (150 wRC+) and been league average against righties (98 wRC+). A solid if not serviceable bat. A clear downward trend. The Yankees love their exit velocity, they fully buy into it as an evaluation tool, and Gyorko might not meet their standards. He is more or less league average (and trending down) when it comes to driving the ball. The walks and the on-base skills and the ability to mash lefties are nice, and hey, unimpressive contact quality doesn’t necessarily rule Gyorko out as trade candidate. It’s just something to be considered. The bottom line here: How comfortable are the Yankees (or any team, for that matter) projecting Gyorko to be an above-average hitter in 2019? Can he maintain the 110-ish wRC+ he’s posted the last few seasons another year? If he declines, can he still be league average? Steamer projects Gyorko has a .248/.321/.421 (103 wRC+) hitter in 2019, for what it’s worth. That seems like something you can live with from an eighth or ninth place hitter. 3. He can play all over the infield. Gyorko is a third baseman by trade and and a good one at that. Good enough that the Padres and Cardinals have been comfortable playing him at second base and even shortstop. Over the last three seasons he’s been a +6 DRS defender at second and a +24 DRS defender at third. Shortstop didn’t go so well (-3 DRS) and I wouldn’t want him playing there full-time anyway. In a pinch? Sure. Full-time? Nah. The Yankees could stick Gyorko at second base while Gregorius is out with Gleyber Torres shifted over to shortstop. Then, when Gregorius returns, the Yankees could either move Gyorko to third base (his best position) and move Miguel Andujar elsewhere, or use Gyorko as a utility guy who plays all around (he’s also played some first base). That’s something you worry about when the time comes though. For now, Gyorko can capably step in at second base while Gregorius is sidelined. That’s the key here. 4. The money works. Holy cats does the money work. Including the $1M buyout of his $13M club option for 2020, Gyorko will be paid a total of $14M in 2019. Do you know what his luxury tax hit will be in 2019? $920,000. Well, it’ll be $916,666.67 to be exact, but yeah. Gyorko will have a six-figure luxury tax number next season. Let me explain. Back in the day the Padres signed Gyorko to a six-year contract worth $35.5M. The average annual value of that contract (and thus luxury tax hit) is a mere $5,916,666.67. Let’s call it $5.92M to make life easy. The Padres were so motivated to unload Gyorko three years ago that they agreed to pay $2M of his $6M salary in 2017, $2.5M of his $9M salary in 2018, and $5M of his $13M salary in 2019. Any cash consideration that is included in the Actual Club Payroll of the payor Club shall be subtracted from the Actual Club Payroll of the payee Club in the same Contract Year in which it is added to the payor Club’s Actual Club Payroll. Notwithstanding the foregoing, an assignee Club may not receive an aggregate credit against its Actual Club Payroll(s) for cash consideration received in an assignment that exceeds the sum of (a) the total amount of the acquired Player(s) Salaries that are included in the Club’s Actual Club Payroll(s) following the assignment, and (b) any cash consideration paid by the assignee Club to another Club in a subsequent assignment of the acquired Player(s) that is attributable to those Players. The $5M the Padres are paying Gyorko in 2019 is subtracted from his $5.92M luxury tax hit, hence the $920k luxury tax number for 2019. Pretty cool, huh? This means nothing to the Cardinals because they won’t come close to the $206M luxury tax threshold next year. It’d mean a lot to the Yankees though. If the Yankees trade for Gyorko, they’d owe him $9M in real money ($13M salary plus $1M buyout minus $5M from Padres) but he would only count $920k against the luxury tax payroll, and that’s the number the Yankees seem to be most focused on. 5. What would it take? This is always the hardest part. I honestly have no idea. The Padres traded a mid-range prospect (Enyel De Los Santos) to get one year of Freddy Galvis last offseason. The Blue Jays traded two mid-range prospects (Jared Carkuff and Edward Olivares) to get one guaranteed year of Yangervis Solarte plus two club option years last offseason. Do those trades work as benchmarks for a Gyorko trade? I dunno. The money could be a significant factor in a potential Gyorko trade. The Cardinals opened each of the last three seasons with a payroll in the $150M range and right now, after the Goldschmidt trade, they’re at $149.5M when you include projected arbitration salaries and all that. St. Louis might be very motivated to unload the $9M in Gyorko and thus willing to salary dump him for a minimal return. If not, giving up a mid-range prospect or two (Nick Nelson? Garrett Whitlock?) would be a-okay with me. I should note that keeping Gyorko would make sense for the Cardinals. Carpenter is a poor defender at third and Gyorko would be a good defensive caddy. Wong could also play his way out of the lineup again, which has happened a few times over the years. That would open up second base for Gyorko. The Cardinals want to contend and keeping Gyorko as a (expensive) bench piece might not be a bad idea, especially because he mashes lefties and Jon Lester, Cole Hamels, Jose Quintana, Josh Hader, and Felipe Vazquez all pitch for division rivals. For all I know the Cardinals might be willing to up payroll next season in an effort to win the NL Central or at least get back to the postseason as a Wild Card team. They have a lot of money coming off the books next winter (Gyorko, Goldschmidt, Marcell Ozuna, Michael Wacha, Luke Gregerson) and it could be they’re open to running a high payroll in 2019 before getting things back in order in 2020. I dunno. If not, and Gyorko’s salary stands in the way of doing other things this winter, I think the Yankees would be smart to swoop in and try to work out a trade. Unless the team changes course in the next few weeks, the Yankees are unlikely to add another infielder on a guaranteed Major League contract this offseason. They’ll attempt to replace the suspended Alex Rodriguez with a bunch of scrap heap pickups and hope one of them sticks at some point. I don’t like that approach but that’s what the team seems to be doing. So be it. While signing a player to a big league contract may be off the table, the Yankees could still trade for a 40-man roster player. They have a 40-man logjam of their own and would be able to clear a spot (or two) in a deal. Jon Morosi reported yesterday that New York called the Padres about their infield depth in the not too distant past, perhaps right after they learned A-Rod’s fate. San Diego has so many extra infielders that they had no room on the 40-man for Dean Anna earlier this winter, so they shipped him to the Yankees for a Single-A reliever. Do any of the Padres’ extra infielders make sense for the Bombers? Surely at least one does, right? Let’s look at what they have to offer. Forsythe, who turns 27 today, is the reason for this post, really. Morosi mentioned he was the “most realistic target,” but I don’t know if that is him speculating or reporting the Yankees are targeting him. Either way, Forsythe definitely makes sense for a team in need of both second and third base help. He has extensive experience at both positions — his defense is okay at best, more likely below-average if he plays regularly — and he even started to mix in some corner outfield work last year as well. Thanks to a year-long battle with plantar fasciitis that prevented him from playing at 100%, Forsythe hit only .214/.281/.332 (73 wRC+) with six homers and six steals in 243 plate appearances last season. Foot and knee problems have hampered him over the years. Forsythe did show a lot of promise during an extended stint as San Diego’s everyday second baseman in 2012, hitting .273/.343/.390 (110 wRC+) with six homers and eight steals in 350 plate appearances. His career numbers in Triple-A are off the charts: .314/.446/.540 (154 wRC+) with 11 homers and 11 steals in 325 plate appearances. “Forsythe is a natural third baseman who’s below-average at second but is good enough to fill in there for a team without a clear in-house option, and his high contact rates give him offensive value even with his lack of power,” said Keith Law (subs. req’d) following that strong 2012 season. Forsythe is a) still in his pre-arbitration years, b) a right-handed hitter who has mashed lefties in the show (124 wRC+), c) capable of playing two positions of need, and d) a buy-low candidate because his stock is down following the disappointing year and injury. If the Yankees aren’t going to spend big on a third baseman, he makes an awful lot of sense as a low-profile trade target. Gyorko is probably the least available Padres infielder. The 25-year-old hit .249/.301/.444 (110 wRC+) with 23 homers in 525 plate appearances as a rookie last season while playing solid defense at second and third bases. Scouting reports and his minor league track record suggest the power is real and his walk rate will eventually come up. San Diego is going to build around Gyorko and they’re more likely to sign him long-term than trade him for help elsewhere. His age, right-handed pop, and defensive versatility would be perfect for the Yankees. Acquiring him just isn’t all that realistic, however. The Yankees have been trying to trade for Headley for years, but the team’s lack of viable trade chips has hurt their pursuit. He is entering his walk year and is projected to make $10M, which isn’t all that pricey for the Padres anymore thanks to their local television deal as well as the new national television contracts. Signing him to a long-term extension is probably off the table though. Headley, 29, was an MVP candidate in 2012, hitting .286/.376/.498 (145 wRC+) with 31 homers and 17 steals to go along with excellent third base defense. He dropped down to .250/.347/.400 (113 wRC+) with 13 homers and eight steals last year after breaking a thumb sliding into a base in Spring Training and coming back sooner than expected. A broken finger sabotaged his 2011 season, but otherwise Headley has consistently been an above-average hitter with double-digit homers, double-digit steals, and strong defense since becoming a full-timer in 2008. I’ve always been a big Headley fan and think he’d be a pretty damn close to a star if you get him out of Petco Park. A switch-hitter with power and patience (11.8% walk rate since 2011) who steals bases and plays the hell out of third base? I’ll take that player on my team everyday of the week. Trading for Headley would be an enormous boost for the 2014 Yankees but it doesn’t seem like the two clubs match up for a deal right now. They’ll have to wait and pony up nine figures in free agency next winter. The Yankees don’t have much need for the 25-year-old Jackson, who is an excellent defender but can’t hit a lick. They have the same player in the older and more expensive Brendan Ryan. The Padres would probably be much more open to moving Jackson than incumbent shortstop and stolen base machine Everth Cabrera despite his 50-game Biogenesis suspension. If the Yankees and Padres are going to get together for a trade involving an infielder, Forsythe is the most realistic target by far.